Really beautiful tattoos!! I maybe will do it, with Riki or Gin in manga version. We'll see when I'm going to do it! Oh wow, that certainly is dedication. What nice tattoos! Love the addition of cherry blossoms on the one of Gin. I must admit; I am rather envious of skin that can handle a tattoo - I wouldn't mind having a tattoo of my boy , but my puny Celtic skin breaks out at the slightest textural change. I'm actually dedicating my entire left arm for it! Oh my! Not fun with allergic reaction at all. Did you get it directly after tattooing? It'll be my first time. It happened pretty much the day after. The area just swelled up way more than usually and it became really warm and painful. The pain was so bad I couldn't stand on it. After a few days I figured it was time to see a doctor. It's only ever happened that one time and the tattoo artist said it was because it was a new type of neon ink. So I should just stick with regular old ink. I have tattoos on my arms and my other leg and never had any trouble with that. So it was definitely just because of the ink type. 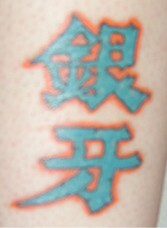 I don’t have a Ginga one yet, but I do have a Kai Ken tattoo. I want to get a manga style Kai brothers tattoo tho! Nice ink guys! I have thought of getting the GNG logo as well, or a meteor/shooting star with 2 scars over as a more symbolic representation.